Just 5 ingredients (fresh green beans, onion, garlic, chicken broth and salt) are all that is needed in this easy side dish recipe for Crock-Pot Green Beans! Your entire family will love this tasty recipe and you will love how easy it is! I love to have a garden. And I enjoy growing a variety of items that allow me fresh vegetables all summer long. My kids love to build bean trellis’s for the beans to grown up and to make it easier to see the beans hanging. I just love how much easier it is to pick the beans and I have more space for other vegetables. Greens beans fresh from the garden are great in the crock-pot. Just a few other items and allow the beans to cook slowly on LOW until they are ready. Garlic and the onion add to the flavor of the beans and then you can season the green beans once they are cooked to your liking. I used some Morton’s garlic sea salt and a pinch of pepper. But feel free to use regular salt and pepper, seasoning salt or even some Mrs. Dash seasoning blends if you are watching your sodium intake. Substitutions are possible for this recipe. Canned green beans can be used in place of fresh. I would use at least three cans of beans and drain them of the water first. You can also use frozen green beans too of course, the same amount of green beans as fresh in this case. This would make a nice addition to a meal. 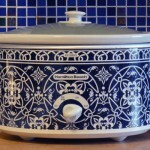 I know some question why you would want to cook vegetables in a crock-pot verses the stove. I can say that there are times where my stove has more pans on it then burners (or it seems like it) and using a crock-pot on a counter just makes less work for me. Free up space on your stove top by making these easy and delicious green beans on the counter top in your slow cooker! In a medium skillet over medium-high heat saute the onions and garlic in the butter.Saute onions and garlic in butter until the onions turn translucent. About 7 to 10 minutes. In the bottom of a 4 quart or larger slow cooker, add the green beans, sauteed onions and garlic and the chicken broth.